Great customer service and professional delivery and pick up! Thank you for helping make the St. Paul Lutheran School Fall Festival a huge hit! Always so professional! Everybody has such a good time! My daughter request them every year! The absolute easiest fun for any party! I rented out the large bounce house for my sons first birthday and the kids loved it. It came with a basketball hoop so the older kids enjoyed it as well. Our rent time was from 2-8 they ended up bringing it 4 hours early for no extra charge. The jump was clean and maintained. I will def be renting from them again and will refer to any of my friends and family. Thank you jay you were awesome! Easy to reserve and pay. Everyone we dealt with was very friendly. Will rent from them again! We had an awesome event and came in under budget thanks to Jump2It party rentals. The community was ecstatic when they saw the bounce house and waterslide. There was never any downtime on either one! We will always use you guys for our events. Staff was professional and helpful from the phone call to reserve the goods, to the day of the event, both setup and breakdown! You have a new customer! Thank you for helping us have a successful event! Jump 2 It was wonderful to work with when I was setting up our Kindergarten end of year celebration. Jay answered e-mails quickly and made the experience very easy. In addition, our students had an amazing time. We have used Jump 2 It the past two years for an event on our campus and have loved the service! They are always extremely accommodating with scheduling the delivery and set up and allow plenty of time for all the equipment to be set up before the start of the event. The staff are very kind and do all the work for you so you literally just enjoy it! No set up or clean up on your part at all. Love it! Wow! What a great company! We rented the 12 foot water slide and Brave Knight bounce house this past weekend and everyone enjoyed their day! Thanks again. Great customer service and superior equipment. We will definitely use them again. Thank you so much for saving the day!! After another company cancelled on me at the last minute, y'all came out within an hour and had a bounce house set up just in time for my son's 3rd birthday! I can't thank y'all enough. Both the guy that I booked with (and cried to) and the guy that set everything up were both professional and kind. I wish I had booked with y'all to begin with - I won't make that mistake again!! Jump 2 It did a great job for our Children's Christmas Party! Everyone LOVED the 18 foot Screamer Slide!! Called the day before showed up early and it was just what I ordered. The kids had the best time! This is the second time i've used the company. Love how polite and awesome the staff is! Have used other companies in the past and the equipment smells horrible. Never had this issue with Jump 2 It. Will deff. be using next year as well! Excellent on time delivery! Equipment is great shape! The community loved the extra happiness Jump2it added to our Halloween Event. Pick up was too late, which was trying for those who worked the event and were tired! Consider adding people to the pick up route in consideration to clients. My order, bounce house, was delivered on time, picked up on time, and the gentlemen who delivered and picked up were professional and personable. This isn't my first time using Jump To It and shouldn't be my last. Thanks, guys! Prompt, Professional, and Personable. Equipment was in great condition, clean, and was installed in minutes. Kids loved it and everything was perfect. Thanks so much! We had a wonderful time. The delivery and pick up was timed perfect. Jump to it did a great job! They were on time, set the bounce house up with no extra charge, and came and took it all down. Highly recommended, and we will use them again! The reservation process was easy. The price was fair. The service was timely and friendly. Overall, great experience! This is a great company to work with. The games are in excellent shape. They came on time and set up and returned on time to pick up. Great customer service and very reasonable prices. We will definitely be using them again next year!! Jay was very professional and answered all my questions. The delivery and pick up went well. They were very professional and the children loved the 4 in 1. We will never rent from anyone else. Chris was awesome! Very professional. The Pirate Ship and Screamer Slide were a huge hit! The bouncy house was a hit! We got the pirate ship for my son's Jake and the Neverland Pirates themed 4th birthday, and the kids loved it. It was brought and set up and picked up on time, from a friendly man. Chris, who delivered the jumper was very professional. He arrived to deliver the bounce house early and arrived on time to pick it up. I will not only use them again, I've already recommended them to several friends who will be using them. Great service wtih Jay and Chris. My twin granddaughters had a great birthday party thanks to the bounce house. They were very professional and courteous to our church members and the our students that were still playing when they came to pick up the equipment. Thank you for your equipment usage! It was great Fun!!! I always use Jump 2 It for my events at church. They are easy to work with. The equipment is always great and I enjoy the people with whom I have contact. Thank You for the great service and we look forward to booking again! This is our 3rd time renting from Jump 2 it and we will definitely use them again in the future! They have excellent customer service, are prompt at delivering and setting up and have wonderful products! We love the inflatables, but we have found a new favorite in the dunk tank! So much fun! I gave Jump2It five stars because they really helped to make my event a success. The children at my granddaughters birthday party really enjoyed themselves in the Pink Castle Moonwalk. They had the opportunity to jump all day. I even noticed some of the parents decided to get in the bouncy house with their children and jump also. They came on time and delivered like they stated. I did have to call the day before to see what time there were delivering. Overall good experience. So thankful for the ease of this rental and the kindness and professionalism from those delivering and picking up the dunk tank. Thank you! Great service, very friendly staff. Delivered on time, picked up slightly later, really appreciated that. Keep up the good job! The jumping castle was as in the picture, great condition, came earlier than expected, which was good, and picked up later than expected so, I want to thank you for the service provided, it was great!! This was a hit at my son's birthday party! The person who came to set it up did it quickly and explained everything I needed to know about the water slide. I will definitely recommend this place to my friends and coworkers. Everything was great as usual. We enjoy renting from Jump 2 It every year. We also know you will be on time for set up and the inflatables will be good quality. My son said this was his best birthday party yet. All thanks to the incredible water slide provided by Jump 2 It. I appreciate the ease of reserving on-line and the clear communication throughout the entire process. It could not have been easier. Thank you! Customer service is fantastic! The water slides we used were very clean and were perfect for our group of 700 kids! We will be booking again next year!!! D. M. G. M. S.
Customer service was exemplary. Communication was great. Any messages left resulted in a phone call within less than 15 minutes. They arrived at the scheduled delivery and pick-up times right on schedule. Once everything was set up, they provided operational instructions and safety precautions for all of the activities. They were friendly, professional, and I WILL be using them again. Very professional! The set up person was there 30 minutes prior to the time promised. Also when I had technical difficulties setting up a borrowed tent, he help us set that up too. I would definitely recommend this company. Cathy B. -. A. P. H. A. R.
Equipment was delivered timely and instructions were clear on operation. Staff were very helpful. 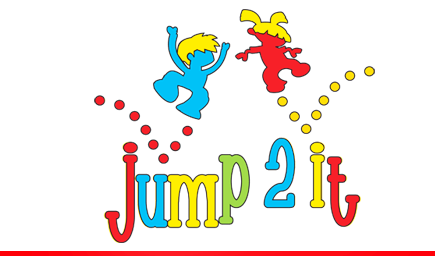 We are extremely pleased and will be booking with Jump 2 It again! The owner & staff are so professional and personable, and everything was sparkling clean. Our guests had a great time. If you are looking for the best, you have found it with this company. From planning to the day of the event, the crew was hardworking, pleasant and professional. We will definitely use this company in the future! Dunk Tank once again was the biggest hit with our Kids Area at May Day. As always all kids loved the bouncy house and obstacle course. Thank you Jump2It for being timely and making everything so easy, safe and fun! Everything went as planned from start to finish! Jay took care in answering all my questions and was very helpful in making a great choice for our party. Wes delivered and picked up our pirate ship timely and was extremely careful to explain everything. We will definitely use Jump2It in the future! We love this company! We've rented from them multiple years for our daughter's birthday party and highly recommend them. Friendly staff and very helpful. We will continue to do business with Jump 2 it. Great! showed up early and setup... had some rain come in unexpectedly and was able to work together so the party could go on... def. recommend them to anyone and everyone!!!! The slide was great. The kids really enjoyed it. They played on it all day. The two guys that delivered & set the slide up were great. Jump 2 It was very helpful with setting up for our event and working with us through various changes. We were told the day before that we would not be able to stake the inflatables into the field and Jump 2 It was quick to help us fix the situation, there was a marathon going on the day of the event and our driver worked with us every step of the way to change the delivery plan, and when we made it to the field, he realized that we in fact would not need a generator which would improve the overall sound quality for the event. I cannot express how helpful Jump 2 It was with our event, we definitely will use them again! Easy on line reservations. Courteous and prompt phone interaction. Given all Info up front. As rain was an option it was suggested to get 3 in 1 combo house. I originally wanted just the slide but the house was much more fun for the kids. The set up and tear down were handled professionally and on time. Over all I highly recommend Jump 2 It. The pirate ship made for a great party! The staff members that did the set up and take down did a good job. Our grown children posted pictures of their kids in the bounce house with the caption: Bounce House = Happy Thanksgiving! It was a hit and the delivery and pick-up were on time and so easy. Thanks again. Top Notch Service and Quality! Jump2It was fabulous. Thank you so much for making my son's party a huge success. Calling before to confirm, being here on time to set up and on time to take away. We will definitely use you again and I will recommend you to all of my friends that need a bounce house. You guys were great! Great Crew. Quick and Easy setup. Well organized. I really appreciate the quality and cleanliness of the inflatables. They were wonderful! The kids had a blast with the castle/slide. It was dropped off and picked up as promised, and we would definitely use their services again! Robin M. E. N. B. C.
Jump 2 It always calls the day before to make sure everything is on schedule. They arrive on schedule or earlier to set up. The staff is very friendly and professional. Also reasonable priced. Jump-2-it was very accommodating with the delivery time & setup location, this company and their team of professionals has always been great to work with for parties. Second year in a row that we've rented from Jump 2 It. Excellent customer service and communication, kids love the bounce house! Outstanding service! Arrived on time as scheduled, very friendly and professional technicians, and they listened and complied to where we wanted the equipment set up! Both adults and the children had a great time on the bungee run! I will definitely use them again!!!! We rented the Screamer Slide and the kids from my school really enjoyed it! The process for renting was easy. Drop off and delivery went very well and we would do it all again! Reservation process was painless. Price was reasonable. Delivery was on time. Equipment worked very well. Everything was excellent! The Jump 2 It inflatables were a great addition to our Missions Celebration Event. The children had a blast jumping, climbing and sliding in them. They were clean and looked brand new. Delivered and set up with plenty of time before the event start time and picked up after. Jump 2 It made our event so easy. They arrived 15 minutes early to set up and arrived right on time to take down, I would highly recommend them and plan to use them again for our party needs. We rented a water slide for our daughters birthday. Drop off and pick up were both very prompt and professional. The workers were super friendly and had the equipment taken care of very quickly. We had a blast with the water slide and will definitely rent again! Easy to work with and very accommodating and friendly. Set up was a breeze. Everyone enjoyed the bouncy castle and dunk tank. We had a lot of fun and hope to use Jump 2 It in the future. Jump 2 It was very punctual and the equipment was clean and just right for the age group. Loved it! The bull was a blast at our event! We were so thankful to have Chris come out to help us with our event. Not only did he arrive early to figure out where we would set everything up, during the entire event, he did everything in his power to make sure everyone had a great time. We love Jump 2 it! Guys were there on time, very patient waiting for payment in the heat and returned for pickup. Great experience ! I love working with Jump 2 It! You are easy to work with, always on time, friendly and efficient. Great experience....would highly recommend your business to anyone planning children's parties. Good job! very courteous and efficient. Great price for the birthday party. will definitely use again in the future......All the kids had a great time. The two hour birhtday turned into a four hour event. Parents were thrilled !!!!!!! was great. Kids loved it. The gentleman who set up did a great job: he was courteous and professional. We rented the 12 foot water slide for our daughter's high school graduation luau & it was PERFECT!! All of the kids (& a few of the adults!) had an ABSOLUTE blast - plus it was a great way to stay cool at the end of May in Georgia! Working with the office staff was a breeze, and the delivery & pickup crew were polite, friendly, and completely capable. They arrived on schedule for both setup and pickup. We can't wait to rent from Jump2It again! The bounce house was the perfect product at a great price. My 11 year old step daughter loved it! The technician, Chris H, was very friendly, professional, and knowledgeable of the job he did for us! Thank you for helping make my step daughter's birthday wonderful!!!! We had such a great time at the party. The inflatable was perfect. Set-up was early and fast! The inflatable was in great condition and served for a fun party! We rented the dunk tank for a summer birthday party. It was a huge hit. Kids of all ages really enjoyed the event. The kids had a great time with the waterslide. We actually had to make them get off of it long enough to have cake and open presents! Best party ever! The set-up was fast and professional. The gentleman that came out had some challenges, but that did not deter him from setting up the waterslide. Jump 2 It made our Oak Grove Elementary School SpringFest worry-free. They were professional from start to finish. They've got set-up and breakdown to a science and of course the kids thoroughly enjoyed all of the inflatables and concessions. Thank you for making our event wonderful! Our students had such a blast at our senior field day. They loved the slide and the gladiator ring. I will definitely rent from you again next year. Jay and Staff were terrific. From the moment that I contacted Jay, he and is staff made our carnival a success. Jay lowered his price to fit our budget. On the day of the carnival, they were on time, cooperative, helped fit our set up needs. They dismantled all equipment on time so we could proceed with our car riders' dismissal on time. They were on time, very helpful and answered any questions I might have had. They also gave detailed instructions on how to operate the inflatables. I would definitely recommend Jump 2 It Inflatables for your next party or event! Thank you for making my daughter's birthday party such a fun and happy experience. All the children and adults enjoyed the slide. Jump 2 It was fantastic! Everything we had hoped for. True to their word in regards to a no hassle refund policy due to bad weather. When the weather did clear Jay was flexible and great to work with. Quick set up and tear down. Kids loved it all. Jump 2 it did an awesome job setting up our product(s) that we rented. The delivery guy was such pleasant In showing how each items works. I will be renting from you guys for our next event in July. Keep up the good work. Chris was very helpful, well informed and professional! We loved the flexibility and options you all shared with us. When our event may have been rained out, Chris called and gave us lots of options! We will be recommending your company VERY highly to all of our friends and family! Jump 2 It was Greaaaaaaaaaaaat They arrived early for set up and was very professional and provided everything I needed. Will be using them again soon. Awesome experience. WIll def use again and recommend to friends. Thanks. Awesome Awesome everything was great! thank you! Everything was awesome! Very nice and professional. Thanks for helping us have a great event!